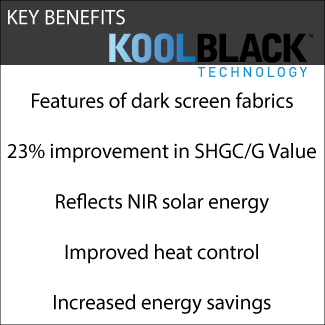 KOOLBLACK™ Technology is a patented technology that enhances dark colored yarn’s energy reflectivity by increasing its near infrared reflection (NIR). While conventional dark screen fabric provides superior view through and exceptional glare control, it absorbs the energy that is created by near infrared wavelength. A dark screen fabric with KOOLBLACK™ Technology enables the fabric to reflect more solar heat, therefore, absorb less energy. 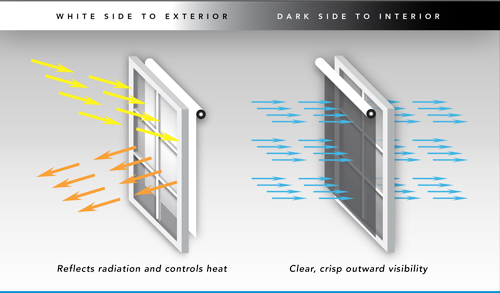 KOOLBLACK™ Technology increases the energy efficiency of dark solar shade fabrics to levels comparable with light colors! Only dark solar shade fabrics with KOOLBLACK™ Technology provide exceptional glare control, comfortable view through and elegant street-side aesthetics while reducing heat. Watch as E Screen with KOOLBLACK™ Technology is put to the test. 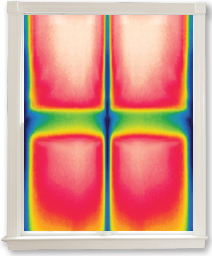 This demonstration shows the heat reflection as well as the visual and thermal comfort properties of KOOLBLACK™ Technology. See the differences between three fabrics: Original E Screen 5% in charcoal, Original E Screen 5% in white and E Screen 5% with KOOBLACK Technology in charcoal. G-Value or Solar Heat Gain Coefficient (SHGC) is a measurement of how effective a glazing system (glass + window shade) is blocking solar heat. 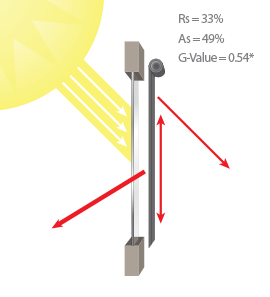 The lower the G-Value, the higher the heat reflection which equals less solar heat transmittance. *The fenestration property tests were conducted in accordance with EN 14501:2005, ASTM 891, ASTM E903-96: Shading Coefficient (SC), Solar Heat Gain Coefficient (SHGC), Solar Transmittance (Ts), Solar Reflectance (Rs), Solar Absorptance (As), Visible Light Transmittance (Tv); ¼ (6 mm) Clear Glass (CL); 4 mm Clear Glass, Single Glazing (CL-S); Double Glazing 4 mm/16 mm/4 mm with low E-coating in position 3, space filled with Argon (DG); SC calculation: SHGC CL-S / 0.87. T Screen with KOOLBLACK Technology is the best performing fabric in its category. 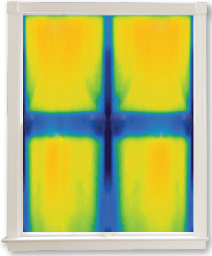 Compared to similar dual-sided screen fabrics, T Screen with KOOLBLACK Technology has significant advantages in heat blockage and glare control. T Screen with KOOLBLACK Technology provides maximum performance with maximum value. *The fenestration property tests were conducted in accordance with EN 14501:2005, ASTM 891, ASTM E903-96: G-Value (Solar Heat Gain Coefficient), Solar Reflectance (Rs), Visible Light Transmittance (Tv); Double Glazing 4mm/16mm/4mm with low E-coating in position 3, space filled with Argon (DG); The above data is indicative. For up-to-date test results, performance specifications and larger samples, contact Illinois Window Shade Company. Remove dust with vacuum cleaner or compressed air. Do not scrub. Do not use solvents or any abrasive substance which might damage the coating of the fabric. Clean with a sponge or a soft brush dipped in soapy water using mild detergent. Rinse with clean water. Leave the shade down until completely dry. You can also very gently rub the fabric with a clean white pencil eraser to remove small stains.